Thank you for joining us on Readers Want To Know! 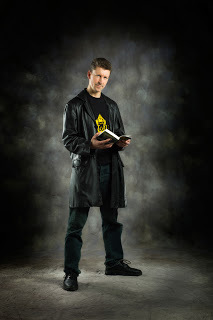 Please introduce yourself and your book. Hi! 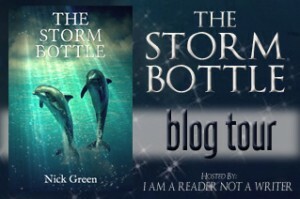 My name’s Nick Green, and my latest book is The Storm Bottle. It’s an adventure set in Bermuda and its surrounding ocean, and the cast of characters includes both humans and dolphins, and possibly a whale or two. I usually say it’s for readers aged 9 and older – though most of its readers have been a lot older. That’s the thing about ebooks I guess. My other books make up The Cat Kin trilogy, published by Strident: The Cat Kin, Cat’s Paw and Cat’s Cradle. These are dark action adventures set in London, and book 1 has been made into a BBC audiobook. Nick, tell us, if you were stranded on a desert isle with a character from your book, which one would you choose and why? I’d choose Hal, the seventeen-year-old fisherman who usually gets roped into being Bibi’s accomplice. He’d be useful as he can fish, and sail, and also has a boat – as we’re stranded here I’m assuming that something is wrong with the boat, but maybe he can help me build a raft or something. He’d certainly be better at finding his way home than I would. Bermuda, where he lives, is effectively a desert island itself (there’s no groundwater – all drinking water has to come from the rain). If you could live through one scene from your book, which would it be? Most of the underwater action would be pretty special to see if you were just a landlubbing human being. 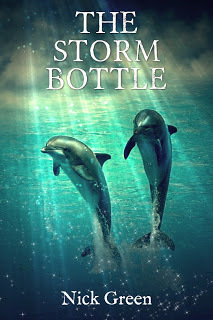 The dolphin characters in the book are constantly chasing, hunting, squaring off against each other and fighting battles – they have highly dramatic lives. I wanted my dolphins to be as real as possible, so almost everything they do in the book, wild bottlenose dolphins really do. They form complex alliances, they call each other by name, and they repay their debts and settle scores. They’ve even been observed making long, unexplained voyages from Bermuda into the middle of the Atlantic. I wondered, where are they going, and why? The book imagines an answer to that mystery. But the scene I’d most like to witness is one that’s so extraordinary, so unique, that it leaves even the dolphins slack-jawed with wonder, because they’ve never seen anything like it in the ocean before. Which is your favorite supporting character from your book and why? Jill the dolphin is a lot of people’s favourite, and mine too. At first she seems like quite a helpless case, because her tail has been mangled by a fishing line, leaving her effectively crippled. But what she lacks in speed and agility, she more than makes up for in the size of her brain – and her heart. She’s Michael’s most loyal and resourceful friend, and he’d almost certainly end up dead in the water without her. The police just showed up at your main character’s door. Why? They’re looking for Bibi, but Bibi’s not in. She’s run away from home and taken her step-brother Michael, who is apparently suffering from brain damage after a near-drowning. What no-one but Bibi knows is that Michael is really not Michael anymore – his body is now inhabited by the mind of a dolphin named Rodrigo. Which is why he’s acting, shall we say, a little odd. Your main character is caught outside in a sudden rainstorm are they mad, happy or indifferent? Why? Bibi is a real outdoors person, so she’s not bothered in the least. Bermuda rain is warm, anyway, and maybe she needs to refill her bottles of drinking water. However, even she has her limits – and these are sorely tested towards the end of the book. There’s weather, and then there’s weather. You can follow me on Twitter at @nickgreen90125 if it takes your fancy. If the numbers 90125 mean anything to you, then you already know something about me, and that’s probably all you need to know. Do pop by and say hi! Thanks for answering the burning questions on Readers Want to Know! It was a pleasure to meet Nick and learn about his book. Bermuda is a fascinating setting and I love dolphins. I was thinking that maybe I'd have to do some 'research' on what it is like to live in Bermuda or some equally cool place for my next book! Thanks for visiting, Medeia.